Mark and I are enjoying our blogging vacation...and yet, I couldn't resist sharing some intriguing, store-bought fruits with you! We got to explore a Hispanic grocery store on Black Friday, and I of course gravitated directly toward the produce department. I didn't try any of the cactus leaves that were available in several different forms, but I did sample one of three kinds of cactus fruits. 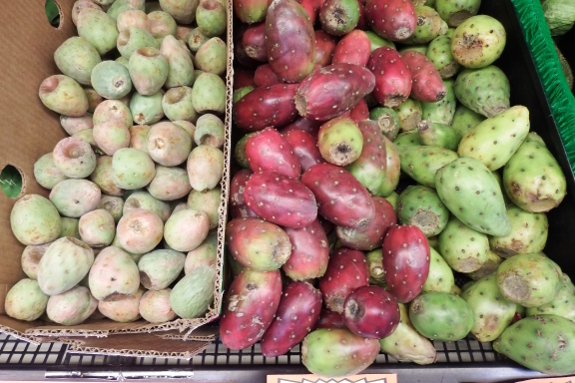 After some research at home, I'm pretty sure all three of the fruits pictured above are from prickly pear cacti, which grow wild in Mexico but also in plantations. There are hundreds of varieties out there, so even though I wasn't a big fan of the one I tasted (the red one in the middle), I clearly need to try this fruit again. The seeds are large and I spat them out, not knowing they were edible. The taste of the one I ate (perhaps a cordana?) was very similar to that of an unripe banana. 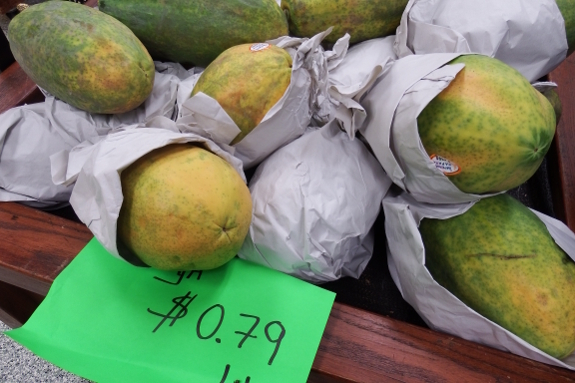 Much tastier, in my opinion, were the papayas. I was spoiled on papayas by eating them for four months in Costa Rica, and I've turned up my nose at grocery-store papayas ever since. 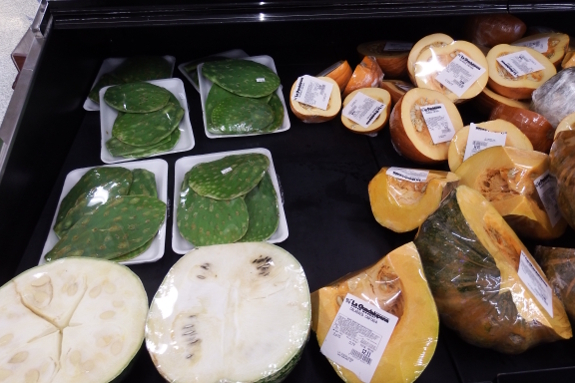 But the ones in the Hispanic grocery were big and delicious (although my fellow taste testers were less impressed, suggesting papaya may be an acquired taste). I hope you all had a wonderful Thanksgiving and a Black Friday as inspiring as ours!